Things happened a bit quicker than planned. My replacement was built early and so rather than waiting until March I took delivery in November. The Scirocco was part ex’d for £7250 which I was happy with given the other discounts I got on the new car and I didn’t need the expense of an MOT after all. It’s been a brilliant car. If you’re thinking of buying one, go ahead, it’s excellent. Running costs are not too bad and reliability is good. The bodywork and interior all held up excellently too. My time with the Scirocco is coming to an end. After nearly 8 years and 56,000 miles it’s time for a change. It’s been a great car. Sadly with dieselgate it doesn’t look like VW will be replacing the Scirocco and I had always planned to run it until 2017 and that time has come. A new car has been ordered for delivery in March so my rocco will be going to a new owner. They’re going to get a cracking car. It’s been valued in the £7000-8000 range which isn’t too bad and was what I needed to seal the deal on a replacement. I just need to MOT it before it goes but fingers crossed that’ll be a formality somewhere around the start of March. Admiral sent me a renewal. £365. New front tyres put on last week by Wrexham VW. The Continental’s I had on before have only last 10,000 miles. Very poor. So this time I’ve gone back to the Pirelli P Zeros at £125 each, fitted. It’s the time of year again when the MOT and service are due. I took it to Wrexham VW today and all was done and dusted by 4pm. I got a video email showing me the condition tyres, brakes and shocks. All done for £250 (£150 for the service, £50 for the MOT and the rest was wipers and VAT). Still got a rumble from the right rear which I think is a wheel bearing that I’ll get sorted at the service and the airbag light is still on. I’m kind of used to the ping on startup now. The thunk from the window seems to have gone away, which is nice. Road tax and insurance came in today. The insurance is always a bit of a joke. Admiral say the quote is £327, that’s £101 more than last year with no changes in my policy or conditions. So I rang up and it’s dropped to £228 in 2 minutes! Mad but it’s like that every year. I’ve also got an alert that the left front sidelight bulb has popped. Luckily I’ve still got a bulb from the double pack I bought last year to do the other side so I’ll replace that when I get a chance. Also got an occasional clunk from the window when it closes. It sounds like part of the window mechanism might be a bit loose. And finally a drone around 40mph from the right rear. A wheel bearing maybe. Service and MOT done…. at great expense!! 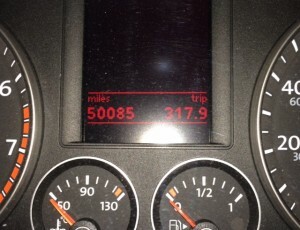 Mileage 44600 and 6 years old now. Well that didn’t necessarily go well. I took the car in for its annual service and MOT and came out considerably poorer than I went in! Although the airbag light was on when I went in and I explained about it needing either to be reset or replaced, it wasn’t on when I got in the car and there’s no mention of it on the paperwork, so I have no idea what happened to that. Front tyres are down to nothing so I’ve just had Continental ContiSportContact 5’s fitted. I hope they last longer than the 12k miles I got out of the sport3’s. 43000 miles on the clock at the momtn so they should take me to nearly 60k. Also had a problem with the petrol flap not pinging open. They fitted a new actuator. The part itself is only £16 but 30 mins labour for £40 makes the total a whopping £56!